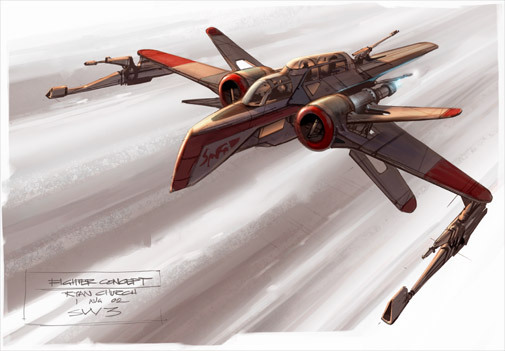 The Aggressive ReConnaissance fighter (also called the ARC-170 fighter) is the spiritual predecessor to the X-Wing starfighter that emerged in the later days of the Clone Wars. One of the few Republic starfighters to bear its own hyperdrive (even the V-19 clone fighter and the Eta-2 interceptor cannot perform hyperspace travel on their own), the ARC-170 is designed to undertake long-range and deep space missions anywhere in the galaxy. Specially-trained clone pilots man these powerful and maneuverable fighters in support roles for their Jedi generals, such as was the case with the squadron led by Odd Ball at the Battle of Coruscant that aided Anakin Skywalker and Obi-Wan Kenobi in reaching General Grievous' command ship. Crew Skill: See Clonetrooper Pilot. Nav Computer: No; astromech droid programmed with 5 jumps. ARC-170: Craft: Incom/Subpro Agressive ReConaissance 170; Class: Starfighter; Cost: 125,000 Credits (new), 60,000 Credits (used); Size: Tiny (14.5m length); Initiative: +4 (+2 crew, +2 size); Crew: Unique (see Clonetrooper Pilot); Passengers: 0; Cargo Capacity: 140 kg; Consumables: 4 days; Hyperdrive: 1.5; Maximum Speed: Attack (Good, 7 squares/action); Atmospheric Speed: 1,000 km/h (17 squares/action); Maneuvers: +8 (+2 size, +6 crew); Defense: 22 (+2 size, +10 armor); Hull Points: 110; Shield Points: 30; DR: 10. Weapon: Medium Laser Cannon (4 fire-linked by pairs); Fire Arc: 2 Front, 2 Rear; Attack Bonus: +14/+9 (+2 size, +10/+5 crew, +2 fire control); Damage: 6d10x2; Range Modifiers: PB +0, S -2, M/L N/A.